Eliminate unnecessary vet bills. No more scoping and having to put your horse on Lasix. Stop the bleeding and keep the lungs free from blood and mucus. Relieve serious allergy problems. 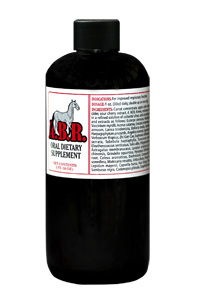 ABR has natural non-chemical dilation action that opens up the respiratory passages. Allow your horse to race from start to finish. Unclog the clog and let your horse breathe.